The national order of the Legion of Honour was established by Napoleon Bonaparte in 1802, and is the highest decoration in France. It was first awarded on 14 July 1804. Since 1994, Pandor has served as Minister of Education, Minister of Science and Technology, Minister of Home Affairs and Minister of Higher Education and Training. 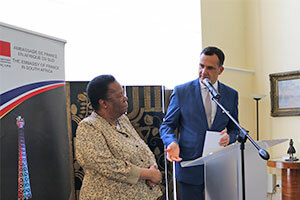 Minister Pandor played a key role in developing scientific cooperation between France and South Africa and Paris is now one of Pretoria's key partners in this sector. Pandor said: “We are committed to the very longstanding friendship between our two countries. The French people and government have granted this honour to persons we regard as illustrious – the heroes and heroines of our country”.